We are pleased to announce Exam Preparation Course for candidates who wish to appear for an international examination. 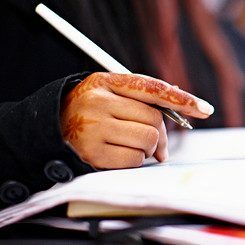 The Exam Preparation Courses are specially designed for candidates seeking the most effective training before attempting the international examination conducted by Goethe-Institut. Through efficient teaching you will be familiar with the examination structure with the help of model test papers and simulations of the various sections. The Course focuses on the following aspects: spoken, written, reading and listening comprehension. The candidates will become familiar with the exam format and learn the techniques and strategies for successfully dealing with the same. Success in these exams opens many doors ranging from greatly improved opportunities in partner companies to easier access to German universities. Goethe-Zertifikat A1: 24.04.2019 - 03.05.2019, 18 - 20.30 hrs. Goethe-Zertifikat A2: 24.04.2019 - 03.05.2019, 18 - 20.30 hrs. Modul Lesen: 24.04.2019 - 25.04.2019, 16:30 - 20:30 hrs. Modul Schreiben: 26.04.2019 und 30.04.2019, 16:30 - 20:30 hrs. Modul Hören: 02.05.2019 - 03.05.2019, 16:30 - 20:30 hrs. Modul Sprechen: 06.05.2019 - 07.05.2019, 16:30 - 20:30 hrs. Goethe-Zertifikat B2: 08.05.2019 - 17.05.2019, 16:30 - 20.30 hrs. For further information please contact our language office.